I’m not a big fan of the fad for stacks, those teetering towers of food often topped with a couple of crossed chives, an artful pile of micro leaves or a shard of crispy chicken skin. As you usually have to dismantle them to eat them, by which time the food has often gone cold, I think they’re a prime example of form over function. So I have no excuse for this brunch stack, which is just as gimmicky, although considerably less elegant than most restaurant offerings. It was going to be a sausagey take on the burger until my husband pointed out that neither of us eats more than one half of the bun in a burger. It’s just too much bread. And that’s a sentence I never thought I’d write because I love good bread. But the ratio of bread to filling in most burgers often seems unbalanced to me. Either that, or it’s so enormous I’d need a jaw that unhinged like a snake’s to get the burger in my mouth, because there’s something fundamentally wrong about eating a burger with a knife and fork. So I jettisoned the idea of a sausage burger and looked again at the contents of my overburdened fridge, which as usual contained a bowl of cold mashed potatoes. Him Outdoors is pathologically incapable of peeling just enough potatoes for one meal so finding uses for leftover spuds is something of a theme in this house. I think this makes a rather fine weekend brunch. To anyone who thinks “breakfast” and “brunch” are mutually exclusive terms I say that this is a brunch dish that uses breakfast ingredients. You’ll need a couple of food rings or pastry cutters, 8-9 cm in diameter. Mash the potatoes and stir in the butter, mustard and parsley. Add enough beaten egg to bind the mix without making it sloppy. Season to taste. Form into two patties using the food rings as a size guide and set aside. Skin the sausages and mash together with another dash of beaten egg. 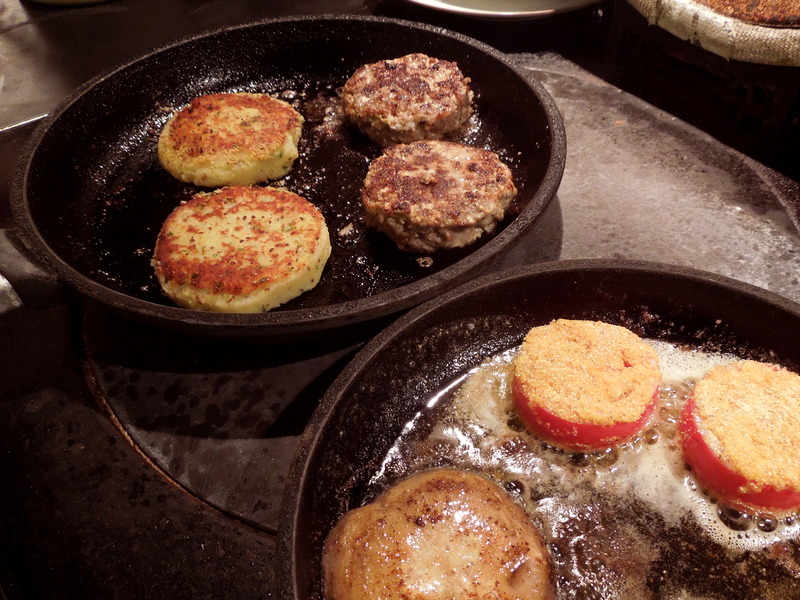 Form into two patties the same size as the potato cakes. Heat a tablespoon or so of oil and fry the sausage patties, turning once, until cooked through. Fry the potato cakes, turning once, until golden on both sides. Keep warm. Take a thick horizontal slice out of the centre of each tomato (save the leftovers for a salad or sandwich). 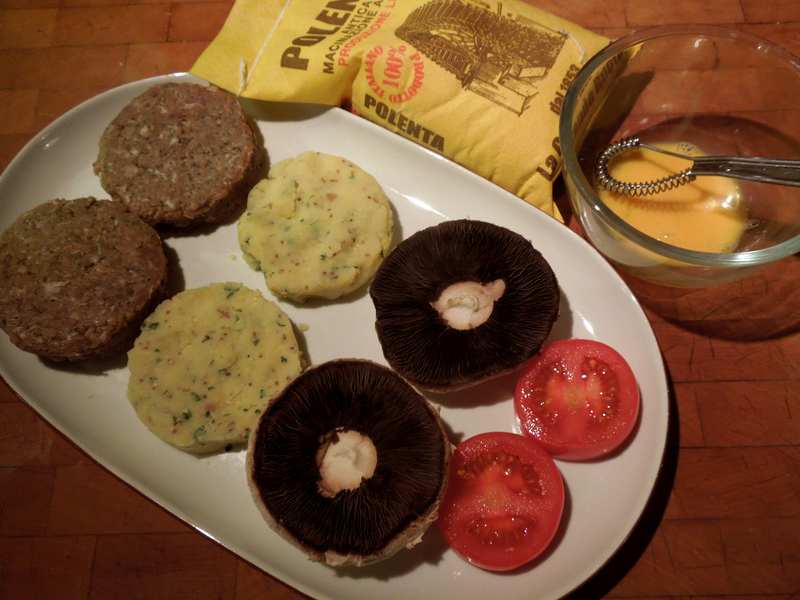 Put the flour, beaten egg and polenta on a series of plates and dip the tomato slices on both sides first in the flour, then the egg, then the polenta. 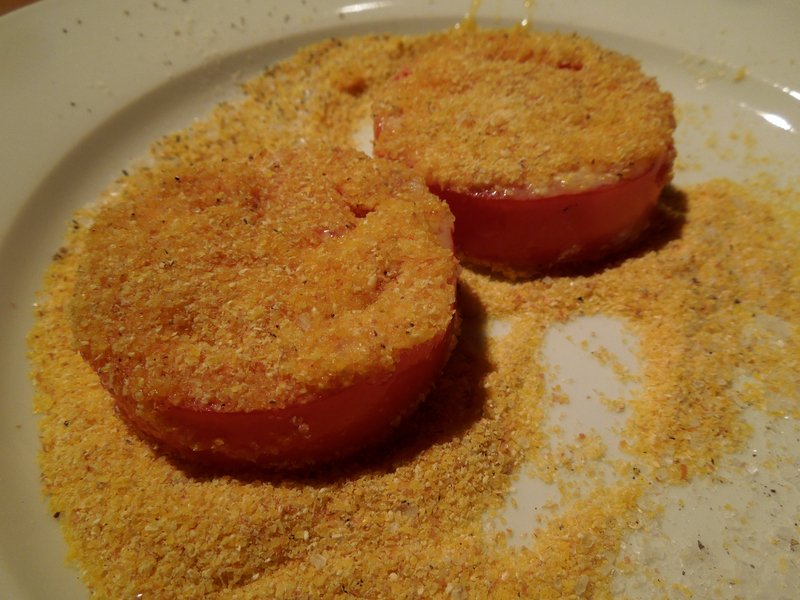 Fry the tomato slices on each side until golden brown and cooked through. 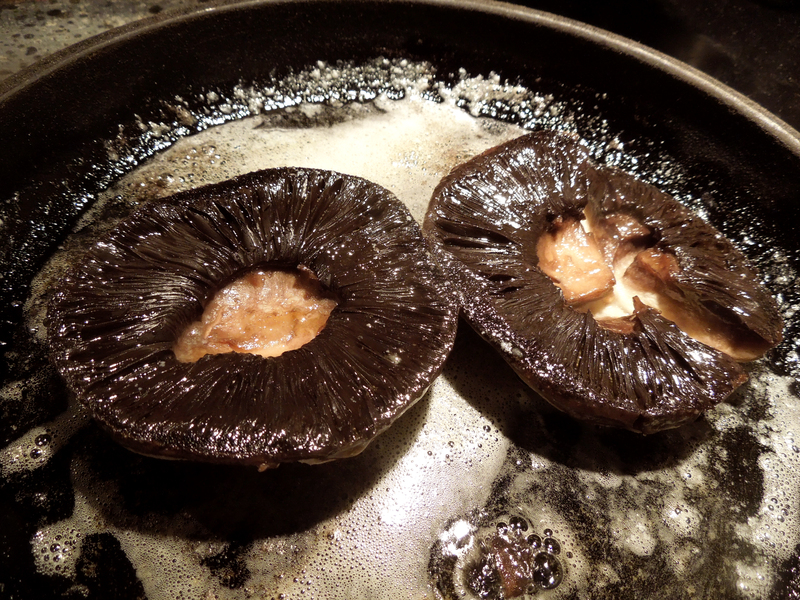 Fry the mushrooms in a little butter. Keep hot. Grease the food rings/pastry cutters thoroughly, heat a little oil in a frying pan and break an egg into each ring. Fry until cooked to your liking, basting the tops with hot oil to cook the whites. To assemble, take two warmed plates and put a potato cake in the middle of each one. 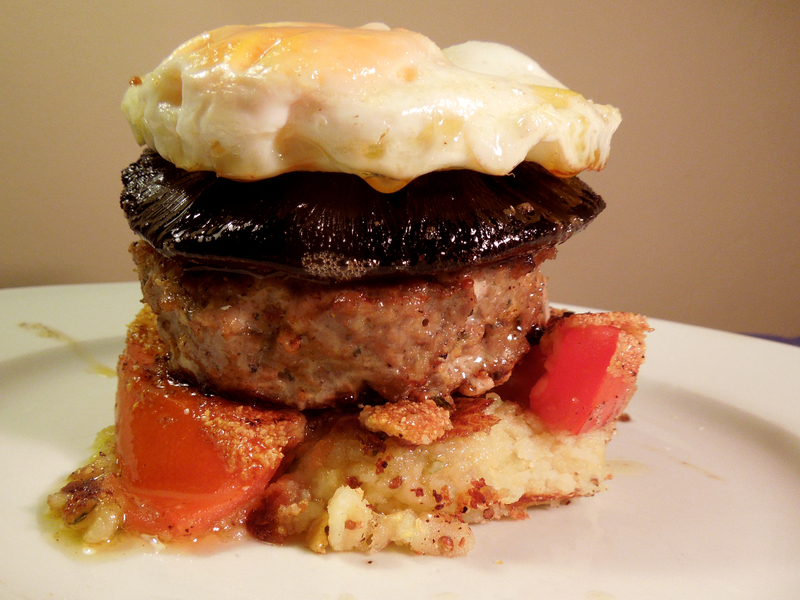 Add a tomato slice, then a sausage patty, then a mushroom and top with a fried egg. Serve immediately. 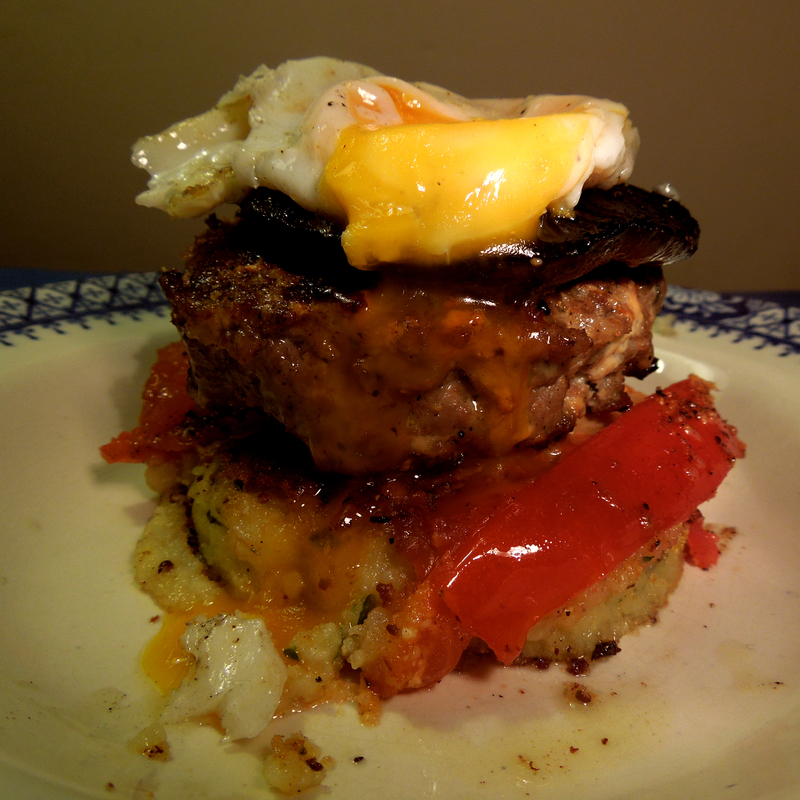 This entry was posted in Breakfast and brunch, Eggs and dairy, Pork, ham and bacon and tagged breakfast, brunch, mustard mash, potato cakes, sausage patties, tomato and polenta fritters by Linda Duffin. Bookmark the permalink. Goodness. I put on two inches round my waist just reading this. Great idea to make potato cakes insead of using bread. I’ll imitate at some point soon. I love your shamelessness. Nice stack, if you like stacks…. Nice breakfast, if you knock it over. I’d love to say that it cuts perfectly so that you get a bit of everything in each bite – but I’d be lying. It was still all hot all the way through after the demolition derby though.